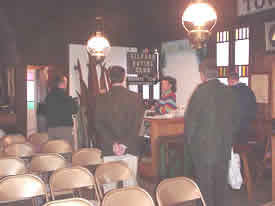 Thanks to Umija Gusinac, Thompson-Ames Historical Society had a unique opportunity on Tuesday morning, November 15th to share some of Gilford’s cultural history. Mrs.Gusinac arrang ed “History and Culture” tours for the members of the Lakes Region Leadership group, of which she is a part. After gathering for a continental breakfast, this Lakes Region group visited Gilford’s museum buildings from 8:45 until 10:45. Stan Piper, Carol Anderson and Pete Allen, T-AHS members, acted as docents, respectively, at the Mount Belknap Grange No. 5, which is on the National Register of Historic Places as the John J. Morrill Store of 1857, as well as at the 1834 Union Meetinghouse and the c. 1838 Benjamin Rowe House, both of which are on the New Hampshire State Register of Historic Places. Serving as tour guides were T-AHS members Carolyn Brown, Mary Chesebrough and Joan Nelson. In planning for the morning’s visit, Thompson-Ames Historical Society took into account the fact that members of this Leadership group come from several Lakes Region communities, namely, Moultonboro, Center Harbor, Meredith, Tilton-Sanbornton, Loudon, Gilmanton, Laconia and Gilford. Therefore, it seemed prudent that the group be given some understanding of the historical chronology of the area. Adair Mulligan’s 1995 book The Gunstock Parish: A History of Gilford, New Hampshire served as a ready guide to give an overview of New Hampshire history beginning in 1620, when King James I of England issued a charter for a council to grant land, control trade and administer the colonies in New England. Included also was information concerning the land grant conflict that arose between the heirs of Captain John Mason and the colony of Massachusetts, the role of Endicott Rock and Monument in the Weirs, the 1664 resolution of the conflict in favor of the Masonian Heirs, and the 1679 establishment of the Province of New Hampshire. signing of a charter for the creation of six central New Hampshire townships: Barnstead, Bow, Canterbury, Chichester, Epsom, and Gilmanton. Attention was drawn to the fact that Gilmanton’s size was 85,000 acres or 133 square miles, an area so extensive that it included present-day, Gilmanton, Belmont, Gilford, Lakeport, and that part of Laconia south of the Winnipsaukee River. However, it wasn’t until 1761 that the first settlers arrived in Gilmanton. Zeroing in on Gilford, four dates were included, the first being the mid 1770s when settlement spread to Gilmanton’s Upper Parish, also known as Gunstock Parish. Next, in 1812 Gunstock Parish broke away from Gilmanton and became the incorporated town of Gilford. Then in 1874, Meredith Bridge, the riverside portion of Gilford, was annexed to Laconia, and, still later, in 1893, Lakeport joined Laconia, completing the separation of rural Gilford from its urban fringe. With this chronology in place, the three Gilford buildings in which Thompson-Ames Historical Society maintains museums could make sense as remnants of Gilford as a farm-centered community. The sixteen members of Lakes Region Leadership were enthusiastic visitors as they toured Gilford’s museum buildings. They expressed the opinion that they had learned much during their two-hour visit. Then, as planned, it was time for the group to move on to Laconia. From 11:00 a.m. until 1:00 p.m. the plan was for the group to visit Laconia’s historic Belknap Mill, where they would enjoy a lunch featuring Bosnian cuisine. The day’s “History and Culture” events ended at the recently refurbished Laconia Public Library, where the group received not only a guided tour but also an opportunity to hear from some Lakes Region cultural groups, such as the Lakes Region Art Association. Thompson-Ames Historical Society is happy to have been part of Omija Guninac’s plans for bringing “History and Culture” activities into the realm of experiences for Lakes Region Leadership.